Utilized Long Ladder for Insp. AEA was part of project team with Parsons-Brinckerhoff, Inc. (PB) for Easton-Phillipsburg Toll Bridge Rehabilitation project for DRJBTC. 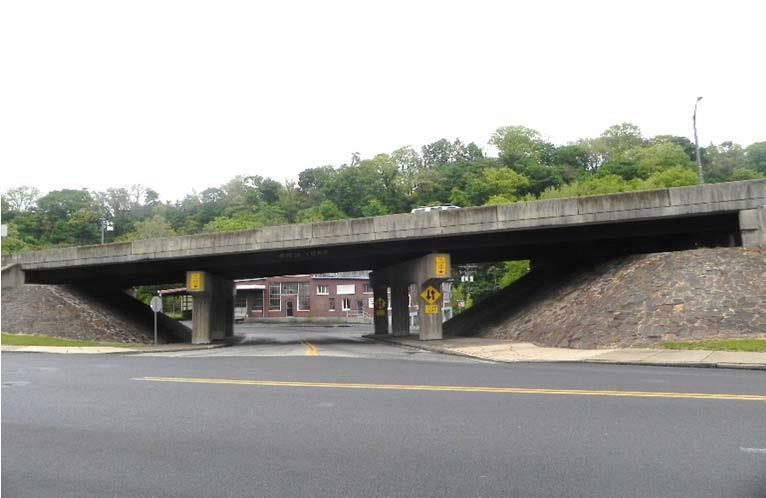 AEA was responsible for field evaluation of the Route 22 bridges over Bank Street and Third Street on Pennsylvania approach and Mono-tube sign structure at New Jersey Toll Plaza. Project involved field inspections to perform existing bridge condition assessment. Performed in-depth inspection for various elements of superstructure and substructures of these Structures, and recommendations made for elimination of deck joints by removing the abutment back-walls, portion of deck slab and approach slab, and reconstruction of semi-integral abutments and portion of deck slab; jacking of both bridges to replaced existing steel bearings with new elastomeric bearings with steel bolsters; remove existing deck wearing surface and resurface with Latex Modified Concrete Overlay on both bridges deck; superstructure strengthening; and substructure repairs. Performed field inspection and prepared condition assessment report for the both approach bridges and Mono-tube sign structure, and submitted to the Authority.